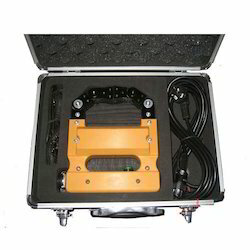 With prosperous industry practice, we are known to offer Magnetic Particle Tester. It is made by experts utilizing the advanced technology. The part is magnetized. Finely milled iron particles coated with a dye pigment are then applied to the specimen. These particles are attracted to magnetic flux leakage fields and will cluster to form an indication directly over the discontinuity. This indication can be visually detected under proper lighting conditions. 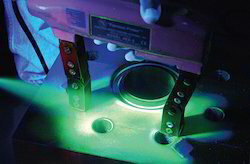 Magnetic Particle Testing is the most commonly used non destructive testing to identify surface or sub surface discontinuities in ferrous materials. Saisrushti provide rapid, accurate and cost effective magnetic particle inspections for the most challenging procedures. Radimage Technologies Pvt. Ltd. Magnet Services, focuses solely on the superconductor of the MRI system. Magnet sales, cryo-refrigeration sales and repair, and field service are just a few of the specialties we offer across the INDIA and worldwide. This NDT method is accomplished by inducing a magnetic field in a ferromagnetic material and then dusting the surface with iron particles (either dry or suspended in liquid). Surface and near-surface flaws produce magnetic poles or distort the magnetic field in such a way that the iron particles are attracted and concentrated. Banking on the skill of our professionals, we are involved in providing Magnetic Particle Testing Service to our valuable clients. This Magnetic Particle Testing Service is widely appreciated for timely execution and excellent working. Our professionals are executing these services as per customer’s specifications. This technique is used to find out surface & subsurface defects in ferromagnetic materials. This is very important technique for detecting very fine cracks (e.g. fatigue cracks) during “In-Service-Inspection. Equipment we have : Magnaflux, Magnafield (India). Magnetic particle testing is a method for detecting cracks and other discontinuities on surface and subsurface of ferro-magnetic materials. Sensitivity of detection is maximum at the surface and diminishes rapidly with increasing depth of sub-surface defects.